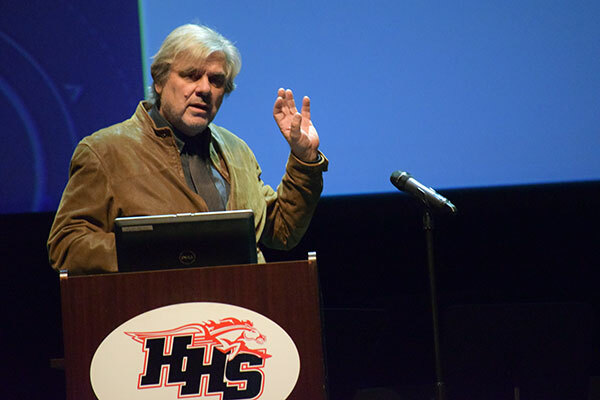 Huntley High School’s HOSA Future Health Professionals Club hosted a presentation by Dr. Riccardo Superina, world-renowned kidney, liver, intestinal transplant surgeon at Lurie Children’s Hospital, on November 30. Superina’s talk, which was geared toward students interested in careers in health sciences but which was open to the entire school, covered his own history, trends in medicine over his career, and advice for future medical professionals. While the medical field has undergone huge growth during his career, Superina said he has witnessed troubling trends as well. A naturalized Canadian citizen, he attended medical school at McGill University in Montreal. But his experience was far different from that of today’s American medical students, he said. Superina, who also is a professor of surgery at Northwestern University’s Feinberg School of Medicine, said both the high cost of medical school in America and the extremely rigorous entrance requirements likely would have prevented him from entering medical school today. In addition, today’s medical students are strongly encouraged to pursue a specialization within medicine far earlier than he had to. “I explored many areas of medicine before I came to my specialization,” he said. That included a clinical internship that allowed him to spend time in many different areas of medicine. After medical school, he worked as a family physician for a short time before becoming more interested in pediatric surgery and eventually, specializing in pediatric liver surgery. Superina is now the Head of Transplant Surgery at Lurie Children’s Hospital and is one of only a handful of pediatric surgeons in the United States with the depth of expertise and scope of training to perform highly specialized transplantation procedures of the intra-abdominal organs in children. He also is Co-Director of the Siragusa Transplantation Center, Surgical Director of Kidney and Liver Transplant Programs, and the Robert E. Schneider Chair in Transplantation. One of his most meaningful contributions to medicine is his development of techniques for transplanting large adult livers into children. Far more adult livers become available for transplantation than children’s livers, requiring careful surgery to reduce the size of the organ. He mentioned cases in which he has been able to complete successful transplants for two children using one adult liver. Those unique challenges are part of what drives his interest in his specialization. In addition, the potential to create a long-lasting and life-transforming difference for a patient is rewarding. He recalled a patient for whom he completed a transplant some 30 years ago from whom he recently received a wedding invitation. He advised students interested in pursuing careers in medicine to study, work hard, and gain experience not only in health sciences but also other extracurricular opportunities to help differentiate them from other applicants. More than 350 Huntley High School students are members of the HHS Medical Academy. Academy members have opportunity to take specialized health-related courses in a variety of subjects and to take part in enrichment programs offered throughout the year. As a senior capstone, 30 Medical Academy students have the opportunity to experience medical professions first-hand through the Youth Residency Program in partnership with Centegra Health System, believed to be the only program of its kind in the country.